The Penitentiary Was Truly a Punishment – Room: The Penitentiary – July 15, 2017 – FAILED! Play if… you’ve always wondered what it’s like being behind bars. Avoid if… you are claustrophobic or scared of the dark. You wake up one day and find yourself locked in a cramped cell. You are cold and alone. Silence surrounds and holds you. Suddenly, you realize this is the mysterious cell in which “The Night Stalker” died. Your heart is pounding. No matter if this is a game, you know your only goal is to escape. Description of the room: This is supposed to be a prison, and as such you start off in cells that are opposite each other. There are 3 rooms (to start), including the 2 cells. Understanding of the Mission: You wake up in the cell of an infamous prisoner and all you know is that everyone who stays in this cell disappears. So, you need to get the hell outta there! Did We Escape: No; read on to find out why. Let’s Take Another Crack at This – Room: The Heist (Redux) – June 2, 2017 – SECOND ATTEMPT! Play if… you get pissed off at not completing the mission and have the cajones to go back for round 2. Avoid if… you think things should always be easier the second time around. Cost: $30 per person up to 4, and slight price breaks after that. We paid $22 each for 7 people this time vs. the $18 per person discounted rate that was offered. 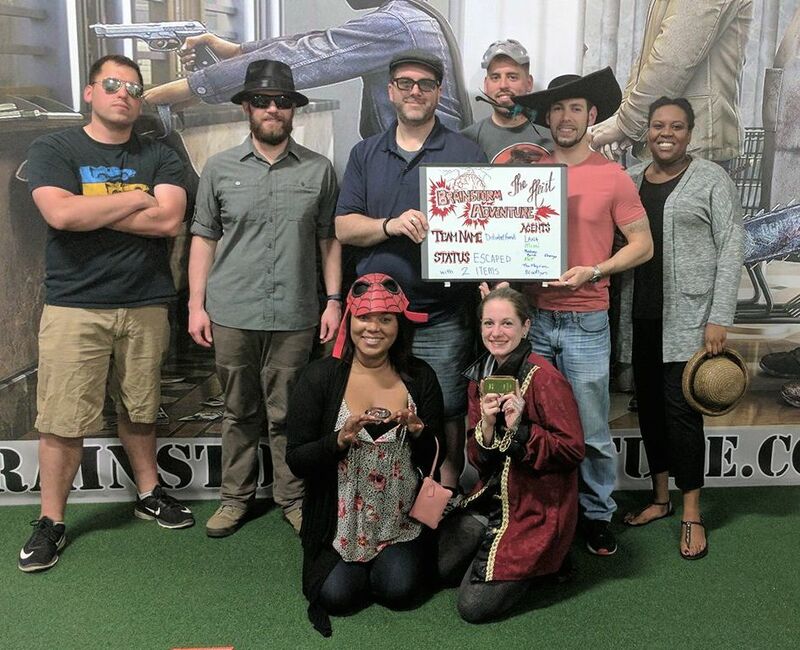 On your second attempt, if you pay $22 up to full price, you are eligible for the whole pot of prize money if your team is the first to complete the room. If you take the $18 per person discounted rate, you are only eligible to win back half of the prize money. NOTE: We suggest you read about our first attempt on this room (Better “Safe” Than “Dead”) before continuing with this post. Understanding of the Mission: Go through Dimitri’s house and accomplish the objectives for each room, solve the tasks assigned, avoid security, make your way to the safe room, and find and escape with all 10 of your boss’ stolen items within 55 minutes, PLUS two secret documents of Dimitri’s that your boss now wants because you didn’t complete the mission last time. So, now you have 12 items to find, and only three clues available to you (versus five on the first attempt). If your time runs out, you get captured and executed (even if you have found some items). Otherwise, you can abort your mission and escape with what you recovered. Did We Escape: Well, we escaped this time by the skin of our teeth (aborted said mission) with six items, so we definitely got better this time. And, we did make the leader board again because we recovered 50% of the stolen items and escaped with those. Our Suggested Party Size: We had 7, and that worked pretty well, but 6 would work too. Where to Eat/Drink Before/After: Try Google. This time, we headed back to Kingstowne for drinks at Fiona’s Irish Pub. Play if… you have some time to kill and have a Groupon, or have a thing for watches. Avoid if… you are claustrophobic. Staging Area: The lobby is up a flight of stairs and has a small number of couches and tables. Description of the room: A small office… nothing too memorable. Understanding of the Mission: Find out what happened to Professor Stanley before you disappear without a trace. Time Remaining: don’t remember… 11 minutes? Our Suggested Party Size: we had 6 and that was plenty. Members of our team (other than the ERG): Melissa, Jess, and Jen. Worth the time and money? Unfortunately, we had to give this one a “no,” and we had a Groupon to discount the price. Roofer’s Union – we stopped in for a few drinks. Play if… you have a thing for people in uniform. Avoid if… you aren’t a member of the NRA. Description (from the company website): This room was a temporary room associated with the 13 Hours movie. As such, the description is no longer available on the site, but our military team was dropped behind enemy lines to complete a mission and find the target of an upcoming attack, radio the coordinates to base and then request an evacuation. Staging Area: The lobby to this location was downstairs in what I believe is the basement level of the building. There were couches and some games to keep you busy. Metro Access/Parking: Tenleytown and then the bus down Wisconsin Avenue, or Dupont Circle and the bus up Massachusetts are your best bets. There’s no metro right by, so you’ll have to drive and find a place to park. Probably better to Uber/Lyft. Description of the room: The room itself was small but packed with goodies: Bookcases, maps, cigars. Understanding of the Mission: We had to find the target for the attacks and then radio in the coordinates and request an evac. Our Suggested Party Size: Doesn’t matter anymore as this room has been replaced, but 6 people worked well. Members of our team (other than the ERG): Dennis, Dennis’ wife, Chris and Dalia. We completed the mission! Members of the elite squad were Dennis, Jason, Dennis’ wife, Chris, Mike and Dalia. Photo courtesy of Escape Room Live Glover Park’s Facebook page.